Is this an electric Mercedes-Benz B-Class? 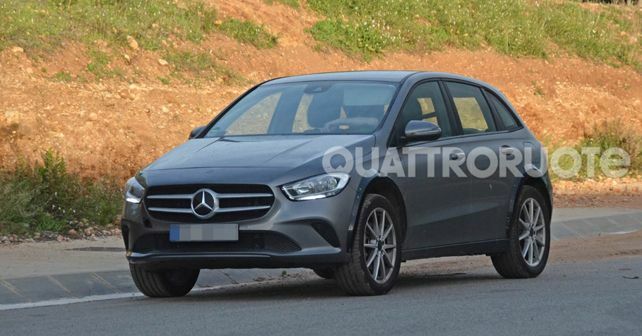 Just a few months after the 2019 B-Class's unveiling, some curious spy shots of a test mule seem to hint at another version of the B-Class. The 2019 Mercedes-Benz B-Class first broke cover at this year's Paris Motor Show in October. Based on the platform of the new A-Class, the updated B-Class is now a much better looking and well-proportioned car, getting rid of the questionable looks of the erstwhile generation and more importantly, shaking the 'minger' tag off its image, given to it by auto journalists unanimously. Just a few days back, the official prices, specifications and variant details of the B-Class were announced for the international markets. However, our Italian partner Quattroruote has recently caught hold of some rather curious spy shots of a B-Class test mule, which has left us somewhat befuddled. You see, going by the images of the standard B-Class, the test mule seen in the spy shots differs in a few crucial aspects. First, the test mule has some extra plastic cladding all around the body, thin strips running over the wheel arches and a wider strip seen below the doorsills. This, combined with a clearly raised ride height, seems to indicate that the test mule has some updates hiding underneath its skin. Second, and more importantly, there are no visible tailpipes or exhaust tips popping out of the rear bumper. While the standard B-Class gets dual exhausts, this one just has a black plastic moulding at the rear with no openings. Combine these two observations and you too will come to the same conclusion - This could very well be a prototype of an all-electric version of the new B-Class. An additional flap on the right rear quarter panel also indicates that it could be housing a charging socket. However, the regular filler flap seen on the left rear could well be a part of the bodyshell itself, or better, could have been left exposed deliberately to confuse onlookers. The ride height seems to have been raised to accommodate a more complex electric drivetrain and the battery pack. However, at this point, all of this is pure conjecture as there is no official word from Mercedes-Benz about an electric version of the B-Class in the works. We'll just have to wait and see if our observational skills have led to a meaningful conclusion or not.